I have this twice a week for dinner.....something healthy and Wild Boar disapproved saying why in the world do I need to skip eating rice when I am not a diabetic LOL! he will grumbles and complains that it is not good to eat this when I am not sick. 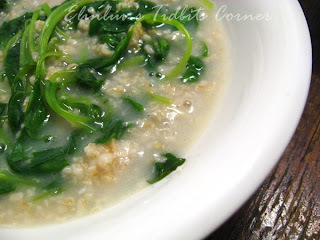 He said oat porridge reminds him of sick people ! BUT he doesn't know how delicious this is ! You can serve oat porridge with steamed fish and some stir fry veggies of your choice. 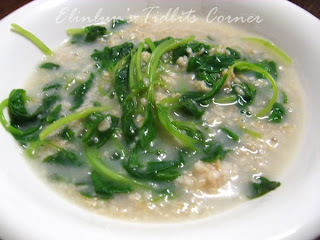 For me, I like to add baby spinach into my oat porridge . Two in One concept, less one plate for washing :p I am eating for the next few days reason being , I will be meeting up with Piggy Jo this coming Friday and will be spending a few days with her and that means eating out most of the time ....so now you know why I have to go on a diet till I meet up with her LOL!